1. Thank The person who have you the award with their blog link on your post. 3. 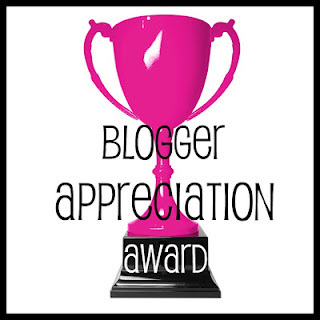 Award the blogger appreciation award as many readers/commenters/followers as you'd like. 4. Let the blogger know you've just awarded them (by leaving a comment/email/tweet/etc). 3. What types of blog do you like to follow/read? 4. What is 1 thing you would like to improve on as a blogger/on your blog? 1. I started blogging on 2010, but at that time I only share about my daily life and random stuff that i like. On November 2011, I decided to make a new blog that mostly talked about beuty products. 3. Mostly are beauty and fashion blog. I also like to read blog about craft or handmade items. 4. My English Language Skill. English isn't my main language and I don't use it on my daily life, so my grammar is really bad. Please forgive me if I make a wrong words/sentences. Waahhh.. Thank you, Shasha :) you're always so kind :) thank you for supporting by giving this award. Success for you too ! Shasha! Thank you for the award! :* And congratulation for you! I like your blog so much! Congrats for your award, you deserve it! finally post it XD LOL..